Luminescent powder mixed into molten glass makes these cosmic stoppers glow. From the brilliant yellow star at its center to the fantastic aurora of the planets, our solar system is full of light. 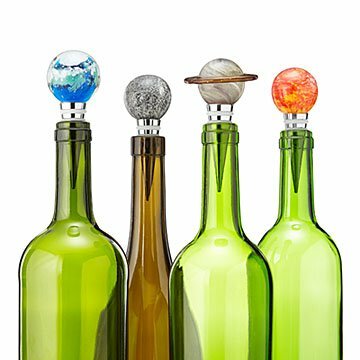 These handcrafted bottle stoppers glow with a little bit of that cosmic energy through luminescent powder mixed into the molten glass. Chinese artisans flame colorful glass rods to shape them into glow-in-the-dark spheres representing The Sun, Earth, Moon, Mercury, Neptune, and Saturn. Paired with a bottle of wine, they make housewarming or hostess gifts infused with celestial style. Handmade by glass artists in China. Bought 4 of these for my husband for Christmas and sadly the sun is already broken after just using it a couple of times. Perhaps a stronger glue should be used? Beautiful , impressive glasswork, stunning! I have a collection of colorful glass bottle stoppers that I use on my outdoor bar in the summer . They are beautiful when the sun shines through them. I can't wait to see this one on display ! bonus: it glows in the dark! I purchased the earth and sun bottle stoppers and have exposed them to sunlight and under lamps but they do not glow. The glasswork is really beautiful.